One of my favorite fables and, unfortunately, still very relevant in today's world. The man with the tusk states that an elephant is like a spear. 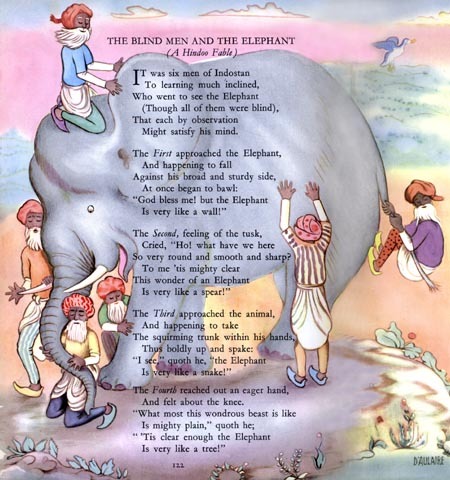 The man with the tail argues that the elephant is like a rope. The man with the trunk says, no, its like a snake. The man with the side thinks its more like a wall. But the man with the leg is sure the elephant is like a tree. The flaw in all their reasoning is that speculating on the WHOLE from to few FACTS can lead to VERY LARGE errors in judgment. The illustration is by D'Aulaire and the poem by John Godfrey Saxe.